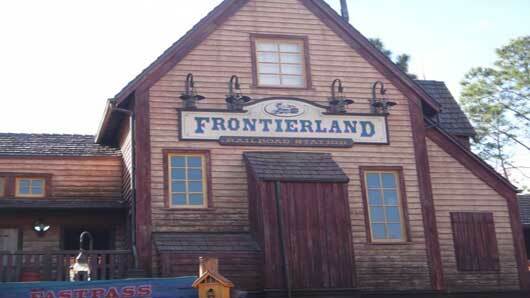 Frontierland is the wild west frontier of Magic Kingdom. 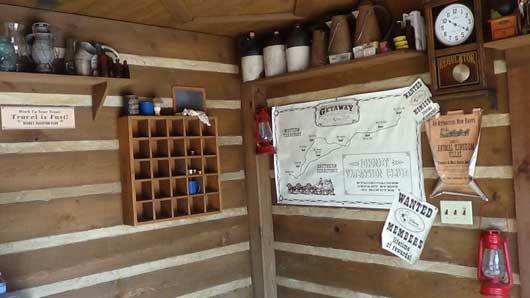 This western town with charming log cabins, forts, mountain ranges, dance hall and a shooting arcade is a look back in time and visit to the early settlers, pioneering and dramatic lifestyle. The mood of the old time west is set by the country music, melody and sounds of the banjo playing. 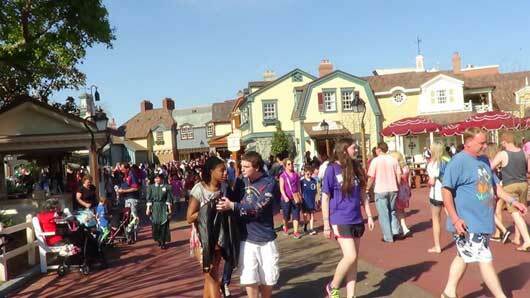 The attractions and entertainment includes Big Thunder Mountain Railroad, Splash Mountain, Tom Sawyer Island and Country Bear Jamboree. 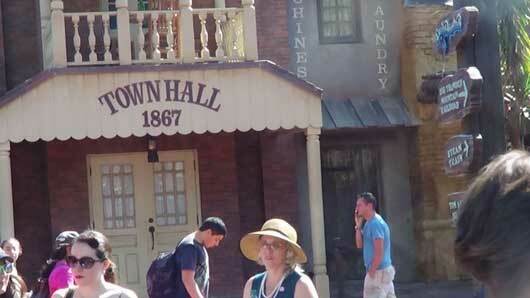 Big Thunder Mountain Railroad is a runaway train roller coaster ride in an old mining camp. Expect tunnels, unsteady shafts, steep hillsides and gold! This ride will transport you through uneven tunnels, a rickety mine and along steep hill sides. On Splash Mountain the log ride, search for Br'er Rabbits laughing place on. 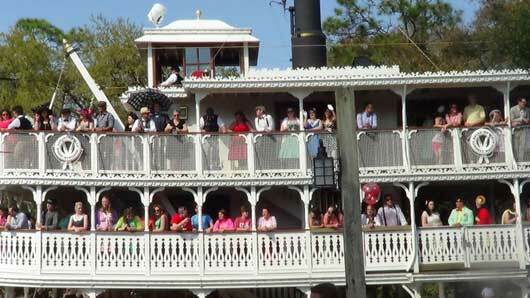 Sail the Rivers of America to reach the blissful island and share in the nostalgia of imaginary St. Petersburg, Missouri. 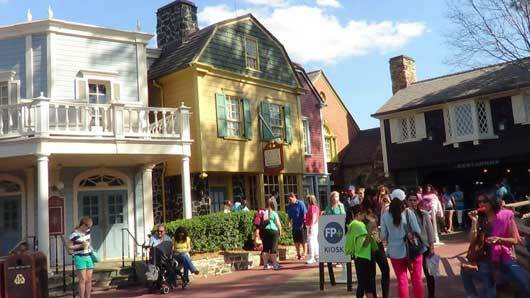 Visiting Tom Sawyer Island gives you a chance to meet Huckleberry Finn, Aunt Polly and Tom Sawyer. It is an outdoor play area, portraying Mark Twain's exciting tales and adventures of a young country lad in19th century. At the Grizzly Hall theater, find the Country Bear Jamboree. Music to fit the frontier ranges from banjo picking to eighteen bears, belting out country tunes. This band of 18 cheerful bears with musical instruments entertain as they sing out some good old Country music classics. The bears, heads of an American bison, a Buck, a Bull moose and raccoon cap are amazing and humorous. 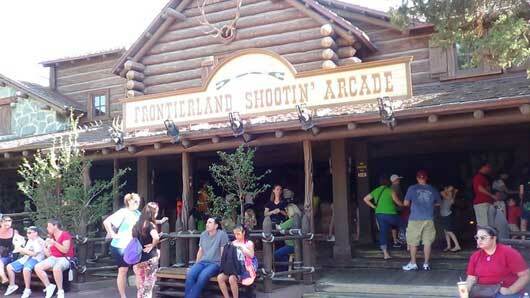 At the Frontierland Shootin' Arcade, you can practice your sharpshooter skills and brag about your scores. Aim and shoot a rifle of infrared light to test your skills of marksmanship. Targets to fire at consist of a jail, hotel, bank, cemetery, pop-up and other stationary objects. Did your light hit the targets or not? 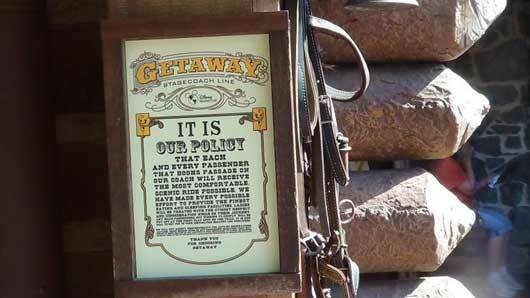 Mose on over to any of the eatery featured in Frontierland for a fine western theme chow down. From fast food to steaks, you will find them here. Dine at Peco Bill's Tall Tales Inn and Cafe for Angus cheeseburgers, Vegetable burgers, Chili-cheese fries, Onion ring basket, wrapped sandwiches, salads, sides and desserts. 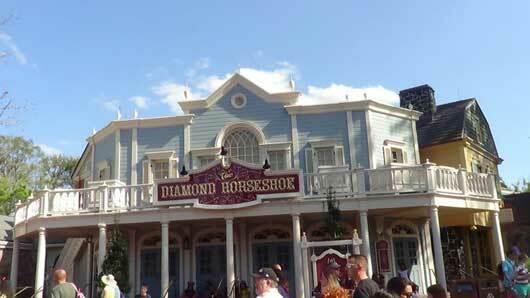 The Diamond Horseshoe is a Western styled restaurant with a quick service lunch and an all you care to eat dinner service of American dishes. The menu consist of carved sandwiches, sides, chips and fruit cups for lunch, and for dinner delicious ham, beef, vegetables, bread stuffing, Saloon Salad and macaroni and cheese. The Golden Oak Outpost offers lunch and dinner, snacks and entrees of chicken BLT flatbread, chicken breast nuggets, vegetable flatbread, fried chicken bread sandwiches, chocolate chip cookies and a variety of drinks. Entrees are served with apple slices or french fries. Shop at the Big Al's for a coonskin cap, sheriff badge, sixshooter, trifles, Native American headdresses and books. Briar Patch shop offers sweets, candy, taffy, snow globes and photo frames. If you are looking for Disney pin tins, Magical Years Collection editions, Limited edition pins and random pins, head on over to Frontier Trading Post for a wide selection. Prairie Outpost and Supply is a general store featuring gifts of gummy bank globes and tinsIns of truffles. They also have sweet treats of boxed chocolates, jelly beans, sherbet, jaw breakers and lolls.